The human body, like the body of any living organism, is a miraculous thing. Each of its billions of cells conducts a specific function to contribute to the well-being of the whole. These cells are arranged in tissues. There are four categories of tissues: muscle, which contracts and provides motion; nerve, which transmits impulses; connective (such as bone, cartilage, blood, and fat), which supports and interconnects the structures of the body; and epithelial, which covers and protects the body and its organs. Tissues are clustered into organs, which, in turn, comprise organ systems. The Digestive System biology study guide unit goes beyond the physical structures and functions of the organs of the digestive system. It requires an understanding of the biochemical nature of food, as it examines the series of digestive processes that occur to simplify food both physically and chemically into absorbable products. The functions of various enzymes and the relationship of hormones to healthy metabolism help complete this topic. 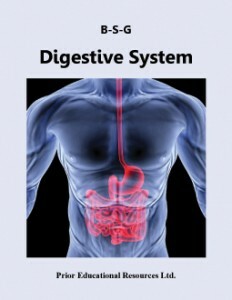 Digestive System is excerpted from our Biology 12 Study Guide, which is the sixth edition of a student study guide written to match the curriculum of British Columbia. The concepts presented are applicable to the biology curricula of other educational jurisdictions as well.